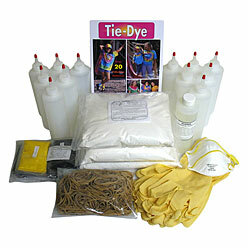 Everything you need for tie-dyeing about 100 T-shirts. This baby is for the really big group, or group of groups, like at camp, a fund raiser, large family get together, or in a school. It's easy, and almost no similar activity has such a high probability of producing a positive experience for the kids while being one that the organizer can survive. What you're NOT paying for is fancy packaging. What you ARE getting is fresh vibrant professional quality dye and great value. Enjoy! It's great fun! #1 Lemon Yellow - 2 oz. #13 Fuchsia - 2 oz. #25 Turquoise* - 2 oz. #10 Fire Red* - 2 oz. #22 Cobalt Blue* - 2 oz. #44 Better Black** - 2 oz. We have chosen vibrant popular primary colors that cannot easily be mixed themselves, but with which you can mix an endless variety of colors. If you have other color needs, buy this kit instead, with no colors, then choose from our preselected color combinations here, or choose your own individual colors here, or use them to supplement this kit. Important note: *dye colors with *, need to double amount of dye to get dark color, dye with **, need to quadruple the amount of dye to get dark black. So these colors don't go as far as the other colors. If you want to have more of these colors, let's say you have some Goth kids who want to do lots of black, you can add some 2 oz jars to supplement your kit. But the 6 - 2 oz jars of dye, even with this constraint, do make enough total dye liquid to dye 100 shirts averaging size Adult L, depending on how heavily your participants squirt it on. You should be able to dye even more if you are doing mostly kids shirts, and less if you are doing lots of bigger shirts or things like dresses. The kit comes with enough chemicals so that if you do add some extra dye, you should not need any more chemicals. See the Instructions tab above for some handy group instructions. The book that comes with this kit also has group instructions and helpful hints in the back, as well as well illustrated ways to do easy patterns. We did, in fact, just use the Big Group Kit this past weekend. I am a Camp Director, and I am planning to have each new group of campers each week (for 7 weeks this summer) tie dye their own camp shirts. We took a practice run this past weekend with the assistant director and the high school counselors. As the person who had to make up the dyes, wash the shirts, etc., let me tell you that your directions were EASY to follow, and the entire process was a minimum of effort. The shirts came out GREAT! I was a little concerned with what I might be getting myself into, since I hadn't tie dyed since the dark ages of the '70s when I was a little kid, but your kit is PERFECT for what we'll be doing. Thank you very much for your terrific product! This group kit was such a good value. It was so much better than I expected. The supplies were generous. The information and advice (from the included book the website and customer comments) helped to make this activity go so smoothly. Because I had read other customer's reviews I knew to use teflon tape on the bottle tops and we experienced no leaking. I also read that more gloves would be helpful so I got a cheap bag in the paint department of my local hardware store. I picked up another bag of rubber bands from the office store too. We tie-dyed over 100 T-shirts at a large family reunion. The youngest artists were 2 years old (they pointed where they wanted their parents to put rubber bands and then did the painting themselves) and the oldest was 87 years. We set up as suggested. One table for folding and tying shirts a soaking area (an adult with heavier rubber gloves did this) and a dying table. I made some sample shirts of different folding techniques and did a short demonstration to begin with. I also had the book available for people to look at. We covered the tables with plastic then made individual work stations with a few layers of newspaper then a couple of paper towels and on top of that I put a very cheap (2$1.00 at a dollar store) baking racks to keep the shirts off the paint puddles. When each person was done we helped them bag the shirt in large zipper bags (from the dollar store 18$1.00) and gave them instructions for rinsing and washing them at home. We would fold up the wet newspaper and paper towels and set up for the next artist. (This worked so great) I had a lot of supplies left over and had fun with my immediate family making several shirts the next day. They worked out just great (the 2 year old's shirt was one of my favorites.) Thanks so much for making it so easy and affordable. A funnel or measuring device to get the dye into the bottles in the right amount without spilling it would have been extremely helpful. 8 of 10 users found this review helpful. We chose to start with this after a small kit of another brand yielded a great return of customers wanting more from our fundraiser for my 19 yo son battling cancer. This kit takes a lot less dye than the store bought kits. I love it! This is a great product. We had it modified because we only wanted two colors (our school colors) and we had more than enough materials to make a shirt for every kid with enough left over to probably do 30-40 shirts. Instructions were easy. the shirts turned out great. The colors were very bright. I wouldwill recommend this product to others. Thank you!!!! This kit was ordered for a professional development event for classified staff at Crafton Hills College. We had a great time doing tie-dye. The kit was easy to prepare and the accompanying pattern booklet was great for how to accomplish some really amazing shirts and scarves. Excellent product price and easy to follow for a first timer with the provided instructions. I used this with a group of high schoolers for our club t-shirts. It was awesome! Good directions and the shirts turned out awesome! Great value great products ensures great results. This is by far the best way to do tie dyeing. The colors are great. Only issue is in regards to the instructions and measurements. Instructions are not packaged with the order and must be printed from the website additionally the dye is labeled in ounces but the instructions are written in tablespoonsteaspoons. The amount of dye received in the standard tie-dye big group kit was not reflected in the instruction breakdown. It took a few more steps to figure out the measurements based on the instructions vs. what was received in the package. Ive ordered this kit before I love it!! I tie-dyed over 50 shirts for a a Zoo trip for 5-6 year olds and believe eve me they could be spotted anywhere!!! I loved it so muchI ordered another kit! I highly recommend it his kit for a good sized project!! The kit was great and the service was even better! Thank you so much! Great kit! Comes with everything needed but shirts!